Worker co-ops are identified as the third type of Cooperative owned and controlled by their employees. The purpose of the worker co-op is to create jobs for their members and allow them control of their workplace. Members provide the capital to finance the business, each sharing the costs and risks of ownership. The management of a worker co-op is concentrated in the business part and classified as a third type of co-op where the members are employees. Usually the worker co-ops are services co-op offering services to other business and they are generally printing, nursery schools, cleaning, consulting, delivery, manufacturing and food services. Major benefits to the employee-members include involvement in the policy-making process, through the election of a Board of Directors, profit sharing through patronage allocations, and a quality of work life that is established by the membership. 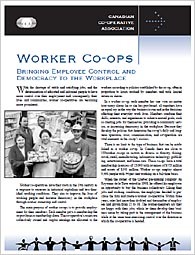 For more information please read about Worker Cooperatives (PDF).